Until now, scientists thought water moved through trees by osmosis, in a somewhat continuous manner. Now they’ve discovered the trunks and branches of trees are actually contracting and expanding to “pump” water up from the roots to the leaves, similar to the way our heart pumps blood through our bodies. The only difference between our pulse and a tree’s is a tree’s is much slower, “beating” once every two hours or so, and instead of regulating blood pressure, the heartbeat of a tree, regulates water pressure. 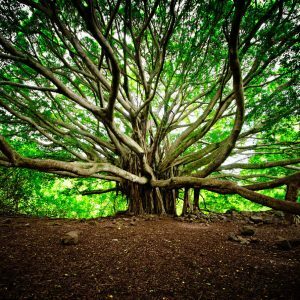 “We’ve discovered that most trees have regular periodic changes in shape, synchronized across the whole plant … which imply periodic changes in water pressure,” András Zlinszky of Aarhus University in the Netherlands told New Scientist. In his 2017 study, Zlinszky and his colleague Anders Barfod used terrestrial laser scanning to monitor 22 tree species to see how the shape of their canopies changed. The measurements were taken in greenhouses at night to rule out sun and wind as factors in the trees’ movements. In several of the trees, branches moved up and down by about a centimeter or so every couple of hours. Zlinszky and Barfod explain their theory in their newest study in the journal Plant Signaling and Behavior. But the researchers still don’t fully understand how the “pumping” motion works. They suggest maybe the trunk gently squeezes the water, pushing it upwards through the xylem, a system of tissue in the trunk whose main job is to transport water and nutrients from roots to shoots and leaves. In 2016, Zlinszky and his team released another study demonstrating that birch trees “go to sleep” at night. The researchers believe the dropping of birch branches before dawn is caused by a decrease in the tree’s internal water pressure. With no photosynthesis at night to drive the conversion of sunlight into simple sugars, trees likely conserve energy by relaxing branches that would otherwise be angled towards the sun. These birch movements are circadian, following the day-night cycle. Their new discovery is something entirely different, they say, because the movements happen at much shorter intervals. I have heard trees drinking after a drought, not just one tree but a whole city block of trees. The sound and volume was quite surprising. WhY does it sound like? My understanding of divine creation is that God is in the trees. Trees (soul) are on the gross plane, after stone. Stone moves very slowly and plants, attached to the earth, move faster, up the planes to worm…who is able to crawl rather than being attached, like trees and plants. In the elemental kingdom of trees, evolution gives life to God’s creation. Worm turns into honeybee, and it is the first stage of leaving the earth and going airborne. Honeybees (and pollinators) are the first to express pure Love in creation. They do what they do in unison with the hive and the Love permeates survival of the whole. Love is what goes on the the hive in order for all bees to survive. Same with all pollinators…they create life out of pure love. What does that have to do with Sharon saying they heard the sound of trees drinking????? The right to have an opinion. Wow, that was so amazingly said Lou… Where might I find more about those teachings? I hope you see this! Don’t ruin nature by referencing a man made “God”to explain something beautiful as Nature is. … forget “nature,” whatever the hell that is. The article is about trees. Please explain how trees behaves, lives etc without input from a Creator. Trees are a part of nature as are we. The life force ‘‘enlivens’ and flows through all living, organic and inorganic matter. As a result we are all connected through the life force to each other…. google Acacia trees and communication. There are studies that show the trees communicate with each other. Oh thank you for not adding to the BS! They don’t realize the whole concept of God is man made.No different to Fairy-Tales. And that book,that made made & man written book/bible has caused more strife in this world than any other THING on this blue planet! Wars are still fought over religion.The one thing that separates us all is religion. Beekeeper here, I take it you have not studied or worked closely with bees. They raid other waker hives, they sometimes kill queens they feel are not performing well, they produce far more drones than are needed which are then forced out to starve or freeze in the fall air, a new queen kills the old queen, so on and so forth. They are decidedly not focused on love. They are analytical, opportunistic, and efficient. People have all sorts of ridiculous fantasies about things they know nothing about. Then again, I would find it interesting to give it a second thought. How sure can we be about the absence of “love” in a bee? We might need to alter and adapt our human definitions of love (ranging from grace of charity, altruism to desire etc.) a little in a more biologistic, less Christian way. What may love be for a bee? It helps in positing emotions for a bee to conceptualize the colony as the individual and the bee as a sub-entity of the hive. Then the evolved behaviors of the hive, such as efficiently replacing queens, can be mapped onto human concepts like self-love. Thank you for some reality Chris. I for one believe in the wonders of the Universe and do not fell a need to explain everything as the workings of some invisible and unexplainable ‘thing’. Bit like humans then! Except bees wouldn’t willingly destroy what feeds them so maybe they’re actually a superior species! What you see is not reality, but your interpretation of it. That is beautiful! I love what you wrote. I let the Dandelions bloom and everyone around me mowed their yards shirt, three times and sprayed chemicals. They got in my eyes because they were spraying chemicals across the street with 50 and 60 mile an hour winds. Someone else who has felt the heartbeat of the trees before science proved it. Thanks for sharing. Maybe yoy dont know, but the first creation as I read in ancient scriptures is originated from water. And there are no such thi g as God or divine is there at some place. Every one is unique in their own nature. Gotta love when a religious nut thinks their magic sky man in pajamas has anything to do with actual intelligent thought. If we were interested in your book of fables, we’d read it ourselves. preach elsewhere please, being a religious freak is your choice, don’t make us suffer for it. what did it sound like? I’ve heard snow fall w a int soft hush sound; but what does a tree heart sound like?? I have heard it, too! After the 5 year drought in Sta Barbara, when the rain came, you could hear the ground sigh as the moisture permeated the clay, and feel the plants breathe, the roots expand as they drank up the water. It went on for a full year as gentle rains soaked in. In time the leaves and branches stopped drooping, the full color was restored to the bark, the fiber swelled. The sound was visceral and rather subsonic, but when you walked the back country away from cars it was a burbling stream quietly running upwards. Wow! What did that sound like? I have a plant that does that. Wow. That’s awesome . Is there a video? Email address starts with a lower-case “l”. In an email address, the words before the “at” sign (name) are not case sensitive. Wow. Thats amazing ! Trees with soul and own language ! Yes,Buddha was born as a tree before being born as man. Buddha Jatak Tales which narrates all the stories of his almost 500 previous births. In that a tale narrates his experience as a tree. and …. ‘you don’t know what you’ve got ’till it’s gone’! Across the street,nestled between houses in the middle of the block was a small forest of century old trees…refuge for small animals too. They did the unthinkable…an apartment complex and parking lot. On the property next to ours we just recently witnessed the landowner have several large mature trees removed so he can graze more animals. It was so sad to see. Made no sense. Grazing animals need a little shade too. It really breaks my heart when I see stands of trees being decimated by developers. I agree wiith you wholeheartedly. Aarhus University must be the one in Denmark, not the Netherlands. Yes it is. The article misquoted the country. The research was done by researchers at universities in Denmark and Hungary. There’s a saying, from little acorns do large oak trees grow. A forest takes decades of tree growth, there will be no trees left if they are all cut down & replaced with younger ones. The planet will become a giant tree nursery,young trees in a baking hot climate & little oxygen left for us humans ect. Big trees, more oxygen for us less harmfull gasses. Think of it like saying, every kid that reaches a certain age is too old so has to be killed. Where do the next adults come from? Just saying. Trees are lungs of the Earth, once they are gone, the Earth, and everything on it will cease to exist. Trees make the oxygen we all need to live. Diane, though trees very much help regulate climate and water in local areas, they do contribute to our local air quality, but do not be mistaken that the majority of the oxygen that we breathe on this earth comes from phytoplankton photosynthesis…in our oceans! Towns in Connecticut prefer to remove trees because of the taxable income from golf courses & shopping centers. Homeowners remove trees because they don’t want to take leaves in the Autumn. Trees naturally cool houses not only because of the shade, but also because cooler air… next to hot air… creates a breeze. Once the tree is cut… the homeowner is compelled to buy a better A.C. system. Great. That is exactly what should be done but is it a requirement therefor it’s not done. In Hawaii for every acre someone purchases an additional acre must be purchased and donated back to the Island. Problem is we are growing at alarming rates, we will run out of space and food if we don’t make drastic changes. András Zlinszky of Aarhus University in the Netherlands? Shouldn’t that be Denmark? Ok, I know this doesn’t sound good, but 40 yrs ago I took some acid ! I ended up sitting under this tree and all of a sudden it started making noises and all the trees were having some kind of communication. I couldn’t believe it.Never forget the sounds of the water running through the tree and their talking, haha, know it sounds crazy, but true.. I always believed that, if used properly, hallucinogenics allowed us to be one with the universe. i believe it as well. Christine and Bonnie – LOVE these comments about ‘those days’. There was SO much more Truth and Spirit in them than people who weren’t there want to admit now days. A WONderful time! And no, Christine, it doesn’t sound crazy at ALL! And Bonnie, I and many others agree with you completely — it’s just that that wave of understanding and experimentation came and went and now newer waves of approach have taken over. But I’ll always believe that those of us who were there and alert and healthy and ‘daring’ enough at the time will never forget how great it was. Thanks! So true! I didn’t do the drugs, but meditated and achieved altered states to “become” trees, animals and even stones. It was so very magical to experience life as a tree and to slow WAY down and feel what it felt like to be a stone. Everything is alive! They all have consciousness and think and communicate and have personalities! Wish I could still do that! Had a similar experience but without acid. Heard the trees ‘talking’in muffled voices – was such an awesome experience! I have heard the same.Nothing wrong with you experimenting on yourself and nothing crazy about it.What’s crazy is peoples cut off from nature so much so that they no longer respect themselves or nature and it’s disappearing.I’ve seen that trees record everything they’ve witnessed in their lifetimes. It’s in the bark.They’ll say I’m crazy, but 50 years from now, they’ll say the same thing and only they could know because after all a machine told them so. there is a study going on that implies that if children are not exposed to nature by age 9 or 10 (can’t remember) they really won’t ever have a connection to it. Scary so many kids inside playing on phones, x-boxes, etc….not outside enjoying. Our natural world will be destroyed if people are not raised in it to learn to protect it, nurture it, and fall in love with it. Christine, I absolutely believe you. Heppened to me too… but with mushrooms. it is one of the joys of human life to discover, and i encourage everyone who have not tried it to do so. but one needs to be slow… their processes happen so slowly. even the tree song of rustling water movements … very slow for a human mind. cheers ! If you liked this article The hidden life of trees by Peter Wohlleben is a must read. Changed my mind about trees forever. The secret life of plants is another good read. I think it was published in the 70s. That book changed my view on many things. Who was the Author? There is a couple books out by that name. Thanks, I made note of author and title. Will be checking it out. I am reading this book right now, I love it. Just finished a second read of it! And at the time this was still a mystery. He just makes clear our current understanding is/was flawed. Have you also read “The Overstory” by Richard Powers? My mother & Father always used to say put your arms around a tree and it gives you energy. smart! I have certain trees in my neighborhood that I greet on my walk. sometimes I shake their branch. I think that’s actually a native American belief. But I believe it too. There was a time when I was extremely depressed- could barely get out of bed to tend to work. But I had the impulse to walk in the woods, which helped some. And then one day on one of the walks, I had the urge to sit with my back against a large tree. So I did. I curled up at the bottom and put as much of myself against the trunk as I could. I was wrapped inside the tree’s energy. I could feel it. It was so much bigger and steadier than mine. And I had a few hopeful images that came to me while I was there. I got up from there a while later and felt good for the first time in s long while. I did that periodically until I got on an even keel again. I believe that. When I was 14 and parents going through bad times, I hugged trees in a hickory stand. I could feel the healing energy and heal them making sounds to each other and groaning with the wind. s have shared their energy with me when I am emotionally upset and they have noticeably calmed me and uplifted me. I love trees! I always had a feeling about trees. Have never been very up on science, but it has always been my feeling that this is the way of trees. Have never heard then talking, but have certainly felt their energy + presence. Trees are so beautiful, not to mention necessary for our planets survival + well being. You’d think they’d get treated a little better. It is or seems like the breathe of life where we all come through. At night I used to listen to the grass grow in the spring you can hear the rapid growth it sounds like a squeaking sound like plastic and plastic but it’s your grass so am pushing up and you can see the blades actually move too. At night in a dark place for the sky can be seen with its full stars at my home on Lake superior when the moon is new especially you can see the aura of the trees glow and pulse like a breath slowly expanding contracting and you can see them receiving energy from the solar wins when doe at night in a dark place for the sky can be seen with its full stars at my home on Lake superior when the morning is new especially you can see the aura of the trees glow and pulse like a breath slowly expanding contracting and you can see them receiving energy from the solar winds coming down from the cosmos…you can see them stretch the light of their aura out to each other, communicating at night One of my native teachers told me that the plants drink and grow at night, while in the daytime they are busy absorb sunlight and converting it into into energy from the leaves into the trunk that can be later on converted into sugar into their water to spread along its branches at night and grow. I can feel & see what you are describing. (I live in a congested city, so it is extremely healing to read your post. My cousin tried to work as a logger but did not last even one day. He said the trees cried when they were being cut down. So yes, they feel pain. Once summer I went without my glasses to strengthen my eyes. One night I went outside n saw this wonderous glowing light like an aura around this tree with small colorful balls moving within the aura. Got my glasses n looked again n still could see it nobody else could though. Will never look at a tree in the same light again …. wonderful read.. I am an empathic person. I sense spirit in all of living beings. I do well relating to all living creatures. Plants are no exception. If you know how to use a pendulum, you can communicate with your plants. I used this method to gauge watering indoor plants. They seem to grow better when watered only when they are ready. Don’t forget to actually touch the plant with one hand and use the pendulum in the other. It sure bothers me when people don’t have the correct information and are ignorant to the fact, like Aarhus is a city in Denmark. Denmark and the Netherlands are very different countries. If you’re going to write about something check on these Minor Details. I won’t be able to sleep until I know the answer now. I am studying that Aria currently. I sing to my plants. It is a beautiful love song. Anyone can go to Youtube and listen to it. Incredible. I sing to my plants and invite them to sing back to me and they do. I have a machine that can be connected to the plant. Plants are almost always communicating – but our human ears can’t pick up their frequency. This machine “interprets” their song for our human ears. So wonderfully awesome!! What’s the name of this machine? I have just returned from Puerto Rico. The damage to the trees is heartbreaking, I could feel the pain and loss. I could also see the recovery by so many trees that were able to withstand the storm. There is a ceiba tree in Ponce whose roots extend approximately 15-20 minutes away, she is magnificent. Being a tree hugger this scientific breakthrough makes my heart sing! I’ve had the fortunate experience of hearing trees ‘talk’ – at first I thought people were hiding and whispering but there was nobody around. I couldn’t discern the muffled tree voices but they were really talkative, and I got the sense they were well aware I was eavesdropping which they seemed to be celebrating. Beautiful, life changing experience. My appreciation of trees has soared exponentially since… absolutely breaks my heart when people cut trees down!!! That reminds me of one of my experiences years ago when I was being a tree, and I was looking around me on both sides and seeing severed arms and legs up and down the street, and my pain was unbearable seeing my family and friends needlessly destroyed like this. Nobody can tell me that what the electric company does to remove all the branches that grow too close to the elec. lines doesn’t hurt the trees. How would you feel if you were one of those trees? BUT…..they say that the heart is NOT a pump! What of this? Why do so many people pay no attention to this? I grew up surrounded by trees. I played among them and later worked among them. Day and night I could hear them rustling with the wind or with the chatter of the creatures that live in them or among them. The forest was full of life of all sorts, and that life depended on the trees for shelter, concealment, oxygen, even food and water. We need to protect the trees, especially from the ravages that some of our own species inflicts upon them in the name of profit. Ok, so what is PC to eat now? Animals are out, and veganism seems encroached on now….I mean really. It’s only a matter of time. Will we go back to everything is ok? What happens now that we are about to say veganism is non PC? Everyone who is interested in this should read the novel “The Overstory” by R. Powers. Amazing book about this very reality of the world of trees. Trees remind me of the spine going up to the brain. I think this research is fantastic and just let’s us know that we still have a lot to learn .I am a plants man and I live for plants and I am so excited by these revelations.I always believed that plants were like humans in so many ways.I would love to keep in touch and congratulations on your scientific discovery. There is a Chinese saying: “Truthfully talking is from heart.’ Trees can talk with us and can cure our emotional disorders and pure our sprits… try to feel it.. Trees are breathing creatures with skin, veins, circulation and nerves. You can feel pain and be happy, have paranormal abilities and soothing healing powers. You can communicate with humans, heal your soul and body, change your character, and give comfort. Please share with The Talking Tree Sisterhood. We are living in a condo in Portland, Oregon that looks directly into Washington Park, the gateway to Forest Park and over 26 miles of hiking trails. I can sit for hours on our balcony looking at the Giant Sequoia (which is designated a Heritage tree by the city of Portland) and the numerous Douglas Firs in Washington Park. I can feel the energy of the trees even from afar. When I practice my gratitude meditation each morning, I thank the universe for the privilege of being near these magnificent giants. I love reading this thread. Some very conscious and corned people sharing. So true, Nancy. It’s refreshing! Aarhus University is in Denmark. The Netherlands is a totally different country. Those heart beats are as a result of xylem refilling process in the night as well as in the day( xylem water breaks make a sound of heart beat). First Remove the barbaric ads of jewlleries from this page. Social life is extremely interesting book about Trees. When I took acid and listened to the trunk of a tree for ages, I heard plumbing noises. Quiet tinkering and clicking and flowing of water, I was convinced it was the functioning of the tree!! Does it mean that the theory of osmose is completly mistaken ? Or will we combinates both theories ( osmose and hearthbeat ) to explain the processus of hydric and mineral nutrition ? Trees have a heartbeat, trees sleep and trees communicate through mats of underground fungi..the day is not long off when we have the same regard for plants as we do for animals ( some of us). Aarhus university is not in the Netherlands…. …or as Einstein said, For me, the mystery is enough.